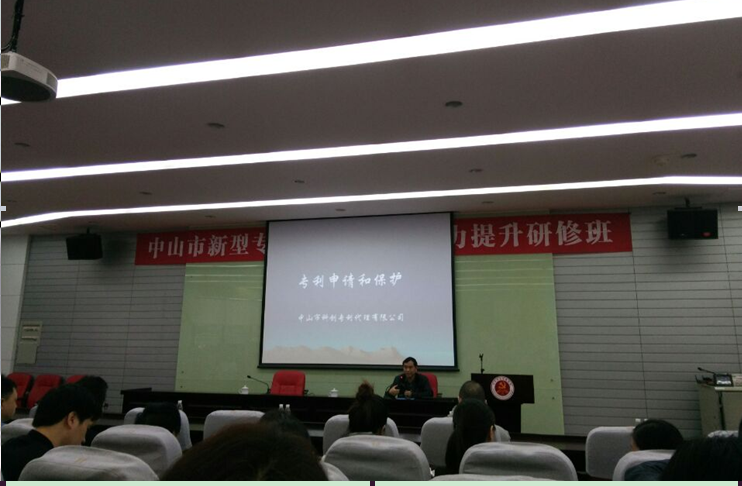 December 14, Zhongshan science and technology and innovation ability promotion seminar held in Municipal committee Party School. Yin Wentao, as the director of our company, the director of China Patent Agent association, the consultant of China (Zhongshan) Intellectual Property Assistance Center, Patent litigation agent of Supreme People’s Court, was invited to Municipal Committee Party School to give a lecture about Patent Application and Protection. Yin Wentao introduced the Patent System in China, how to file an application, how to safeguard the rights and Patent invalidation. He was admired by the representative of the enterprises. When finished the lecture, he answered the question and gave constructive suggestions to the enterprises. The lecture popularized the patent knowledge, improved the concepts of using patent to protect benefits and raised the publicity of our company. It showed our capability and positive image. 下一页：Yin Wentao, had been elected as Intellectual Association director of the third council.